the recipe was from the Chinese Kitchen book. But i modify the method of cooking. It was meant to be add water, boil and dump everything in type of stew. But I prefer to fry the chicken with the sweet smelling Szechuan peppercorns to enhance the flavour. Turn out to be such a wonderful dish. 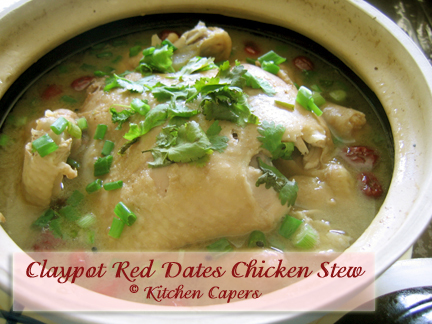 Soup is very sweet due to the Red Dates. Very appetizing in flavour. Chicken meat should break away from the bone easily. This dish was meant to be cooked for 2 hours over a charcoal stove. Since I don't have one, I cook it over a regular gas stove and for 1 hour only. 1. Heat up claypot with oil and add ginger slices to stir fry. 2. Add peppercorns to fry till fragrant. 3. Place half chicken, skin down to fry. 4. Let it fry over high heat for about 5 mins. 5. Turn over using a pair of kitchen tongs or chopsticks. 6. Add water, celery, white spring onions, sesame oil and cover to simmer over low heat for 45 to 50 mins. 7. Add remaining of the ingredients, cover again to cook for another 15 mins. 8. Turn off heat, serve and garnish with coriander leaves or spring onions. My mil is quite impressed with me now... He he he! Thanks to your easy to follow recipe. This is yummy! Gina.. where can i get the szchuan peppercorns? found that NTUC sells it now. Its at the section where they put all the Asian spices like Black Pepper, White Pepper, Cloves, etc. I tried this last night using Kampong Chicken (I put the whole chicken in instead of half and didn't change the quantum of other ingredients except reducing soy sauce). Verdict, VERY YUMMY, whole family like it. Thank you very much. Oh ya, being lazy I didn't fry the chicken, straight away simmer it and I don't get your nice colour too. Most importantly it tasted GOOD. very good as tonic. especially for rainy days. the frying is just to make the chicken more fragrant, and the meat more compact. Becoz boiling it will make it too soft. Hee... this is the first recipe from KC that I have tried. 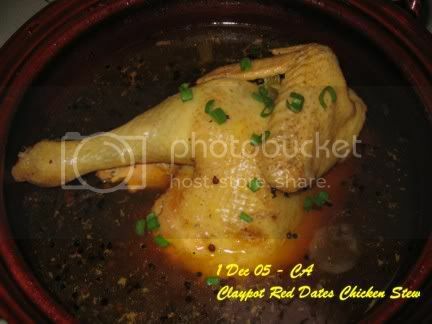 I used chicken leg as I was the only person eating at home that day and I removed most of the skin cos it is too fatty. It taste really good and I finished drinking every single drop of the soup. Yummy. Thanks Gina for the the very easy to follow recipe. Thanks Gina, this is good. But i substitute celery with leeks. Again, this looks soooo great! Question is, where could I find the Red Dates, or could I use something else? mitmondol, if u're staying in singapore, u can get them from any chinese medical hall, Yue Hwa @ chinatown. hope this helps..
Oh no, I'm in California! Any1 from CA? Help needed here!! Thank u! 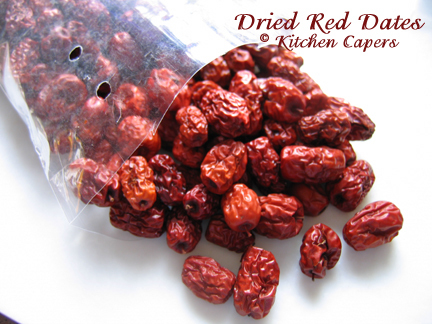 You can get red dates from the Asian stores. Chinese, vietnamese, all carry them. Very cool! Next time I'm going to look for it. Does it come in a can or box? Thanks Gina, these great pics help a LOT! Could I use something else if I can't find it? Haha mitmondol! Glad that our screams works! You're welcome Mitmondol. :lol: The dates are usually packed in clear plastic bags or plastic containers. 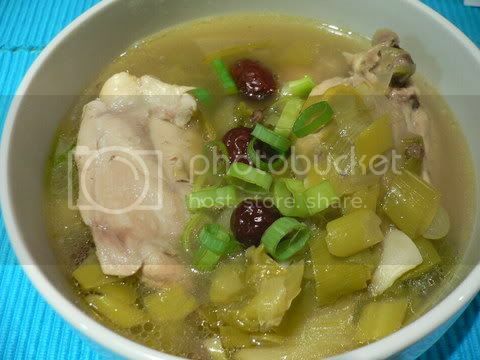 Thanks Gina for this superb recipe, both the chicken and soup are finished to the last drop. I added in a splash of Shaoxing wine just before serving, turns out heavenly! Really like a tonic soup. Angie!! (*waving frantically!) glad my pic helps. Made this for dinner today. The soup is yummy and it's easy to make too. Thanks so much for the recipe!